Update: We have our Avery HI-Liter Giveaway Winners! Two teachers are starting the new school year with three dozen free highlighters! I am an English teacher of 6th graders. Middle school is brand new to them, and they have no idea how much they need highlighters when they get to middle school. We use them DAILY in English class for reinforcement, emphasis, and to add a little “color” to our lives! I would love to win these for my classroom! My anatomy students have a lot of vocabulary with the 11 different body systems and it often gets confusing for them if they cannot sort it. They also come from very low income homes with many being on free and reduced lunch. Many can not afford to buy the extra supplies yet alone the basics such as paper and pencils. Thank you for your consideration and for being so kind and generous. Congratulation to two great teachers! As usual, we’ve got another great giveaway going on right now! Head on over the the E.S. Robbins Giveaway for your chance to win a cool collegiate chair mat repping the team of your choice! Enter the Avery HI-LITERS Giveaway now for your chance to win! Get three entries and three chances to win by entering on Facebook, Twitter AND the blog. 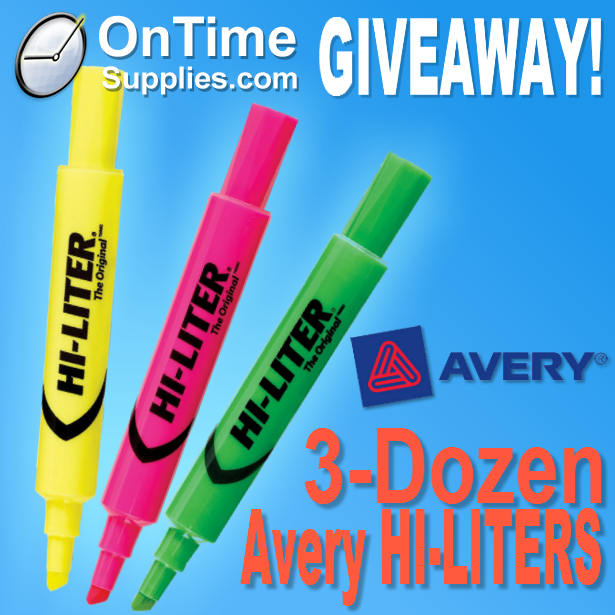 The Avery HI-LITER Giveaway ends next Monday, August 19. 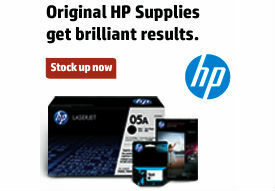 We’ll announce the winner here at the Office Ink Blog Wednesday, August 21. Good luck! Need these for my classroom. These would be an amazing asset to the classroom. I ran out of highlighters last year and have yet to purchase new ones for my kids this year, with only a week left before school starts. I should win because my mom loves highlighters (and all school/office supplies). I would love to give these to her. Would love to have these in my classroom for math and reading time!!! I would love to win to share with my students and other teachers at my Title One school. Students often come to school without the supplies they need to learn due to poverty and other difficult situations at home. Winning would help kids coming from those situations. I go through a ton of highlighters every year in my classroom. It is perfect for kids and staff to use. I use a lot of highlighters during the year. I can use them to highlight data and other things during the year. I need them, because last year’s class used up all of mine! I would love to share with my fellow teachers! Thank you for the opportunity! I could really use these for my classroom. These would be great to win and share with the kids at school. I certainly could use them to help the kids in the special education class with highlighting important information in many of their reading materials. I love the opportunity to choose a color besides yellow. It makes their day!!! I love to highlite my life! I trust the original hi-liter and love how bright they are – they do not dry out like other brands. Thanks for the opportunity to color our lives in class! Highlighter are a must in our Science Class. We go through a few hundred every school year. Need these for my niece and its perfect for kids!!!! My 5th grade class would definitely put these to good use this year! Kindergarten loves to highlight sight words when we begin reading. Last year I used just yellow. The colors would be great! I should win these so my students can use them to identify the different parts of word problems in the 3 different colors. I work at a title 1 school with children who don’t have the money to donate supplies. I would love the opportunity to supply my classroom with needed materials to give my students the very best education they deserve! I use color coding to help students with reading comprehension and normally buy them with my own money. I need these to use in my classroom as well as share with my fellow teachers! I teach in a very low income area. Many of my students (4 and 5 year olds) do not even know how to write their names. I use highlighters to write their names on their papers and they trace them to help practice their fine motor skills. I go through A LOT of highlighters. This would be a great prize! I always forget to remind kids to bring theirs to class, so when they need them it’s nice to have them in class already. I’m a first year Kindergarten teacher and could really use these highlighters. The kids love to highlight the letter of the week, but they forget to put the covers on them and they dry out on me. I can’t afford to keep replacing them, so this would be a big help. Thanks for offering such a great gift!! These highlighters would come in handy in my math classes to highlight the formulas and the theorems that the students need to memorize on a daily basis. By the way, this is a Title 1, at-risk high school. This is my first year of teaching and I found out I got the job a week before school starts. I am really trying to get everything together, but it’s very difficult with not having enough money to spend. This would really help me out and I would be able to provide my students with what they need to excel. I would really appreciate it if I receive this. i’m a new first grade teacher and could use any supplies!!!! Could always use highlighters to help students learn how to find important key information, especially in text enriched areas like math, social studies and science!